Brand Whitlock and the memory of the "Civil War"
Beginning in August 1914, the First World War is particularly known for the uncanny violence of its battles, the penetration of technological innovations as efficient as they were frightening, and for having rung down the curtain on the old pre-1914 world. However, one unanticipated, unexpected and, in particular, very original consequence of this war was the construction of an electrified fence between Belgium and the Netherlands. What was the reason for this? While Belgium saw its neutrality violated by German troops, complete with losses and clashes, this was not the case in the Kingdom of the Netherlands that remained neutral during the conflict, spared from the "horrors of war". Well, almost. If one looks at the map, it quickly becomes obvious, even to the uninformed, that the border between Belgium and the Netherlands could become of crucial importance, on commercial, military and political levels. What could the occupier do in order to prevent its regime from being weakened by a kind of "sieve", an outlet through which the Belgians – amongst others – could flee the occupied zone and travel to England or meet up with the Belgian government in exile in Le Havre, for example? How could it avoid this haemorrhage? 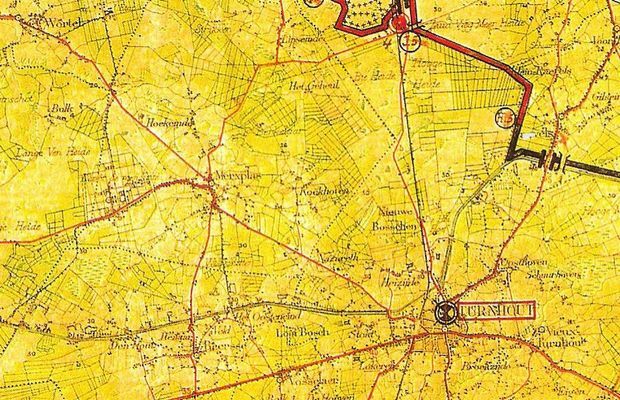 In January 1915, the Germans have to accept the facts: the border between Belgium and the Netherlands is a thorn in their side. Nearly 6,500 young Belgians have already travelled to Great Britain via the North. More than 30,000 will do so during the entire conflict. The occupier therefore take measures in keeping with the stakes. Firstly, in fact, for the British, the Netherlands represent the starting point for their espionage operations in occupied Belgium. Secondly, a significant number of letters from the families of Belgian soldiers transit via the Netherlands before reaching their recipients. The traffic grows, bringing in nearly 15 Belgian francs per kilo of letters for the smuggler who takes on this task! Finally, many Belgian escapees and German deserters – especially at the start of the war – make their way via the Netherlands; some of them are helped by notable characters, such as the young Countess of Ursel, who will be convicted to one year of prison in Germany. 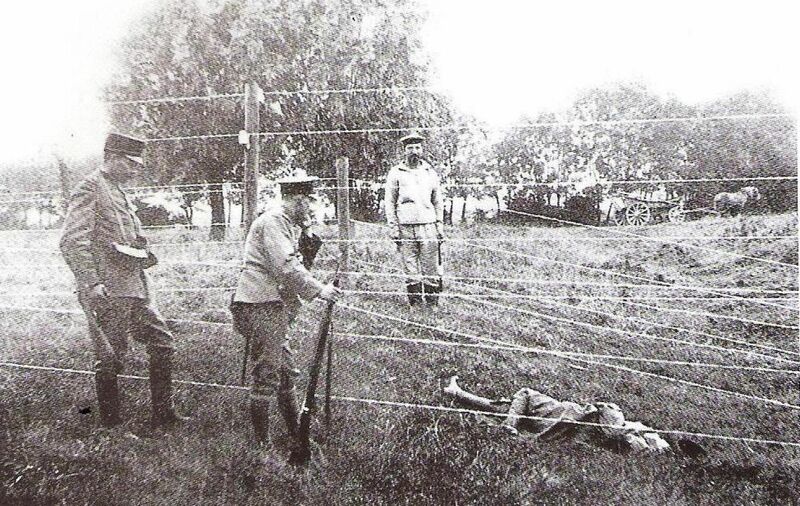 At the end of June 1915, in order to deal with this situation and to get out of this rut that is as curious as it is difficult for the occupier, the latter begins installing an electric fence, with the voltage of 2000 V.
One of the most important witnesses for the history of the First World War in Belgium, the representative of the United States in Brussels, Brand Whitlock, had the following to say about the "Iron Curtain" (translation): The vigilance increased sharply at the Dutch border. All along, in the melancholy Campine with its woods of pine, small oak trees, its moors and their purple heather, there stretched a complicated network of barbed wire, but on one side a high barrier of sparkling iron wire, charged with electricity and that caused death with a single contact. Men would face these wires by forcing barrels open at either end between them, and then making their way through. Sometimes the wires were insulated with rubber coverings, sometimes they were cut. Later, the Germans strengthened the wires, set up double rows, and the barrier became higher. Along the Escaut, small boats were needed to get by. But many men would dive in and try to swim the river, with many being shot in the water by the guards. This voyage across the border was long and dangerous; it would often take several days, stopping in certain barns, homes or little cafés, along the lines of what our grandfathers called an "underground railway" in the days of the Civil War. Some men knew the passwords, and in the woods, poachers served as guides. The itineraries, passwords, stations and the entire mysterious system changed often, since German spies found them out sooner or later. For more than three years, Belgian smugglers and traffickers had to display remarkable ingenuity in order to get around this electric border. In the region of Kanne, home to a quarry for marl (sedimentary rock consisting of limestone and clay), some people used this breach in the German surveillance system in order to reach their objective. The quarry was quickly closed by the occupier. This fence brought with it a true feeling of fear, affecting daily life. Let us give the example of a certain Ida Martens (community of Luyksgestel), whose dog very unwisely approached the electric structure and tried to bite it; the animal's teeth were promptly blown out of its mouth. 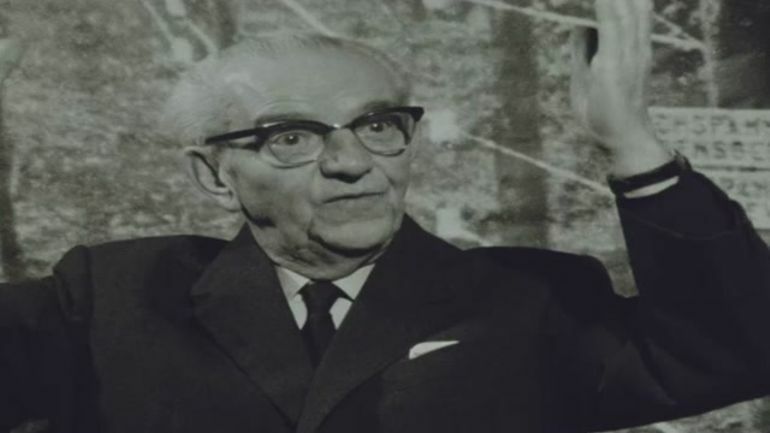 On another level, there's also the example of young Joris Leunen (region of Wortel), born in 1909, who remembers that his teacher used to regularly take the students to the closest morgue, in order to show them the bodies of the latest foolhardy smugglers who had passed from this life thanks to the fence! This did not help to calm the atmosphere, nor to reduce a climate of fear that, bit by bit, can turn to psychosis. For the sake of legend, the popular imagination recalls the sketches of smugglers crossing through the fence by means of a barrel. However, this is in reality a fine example of war propaganda. 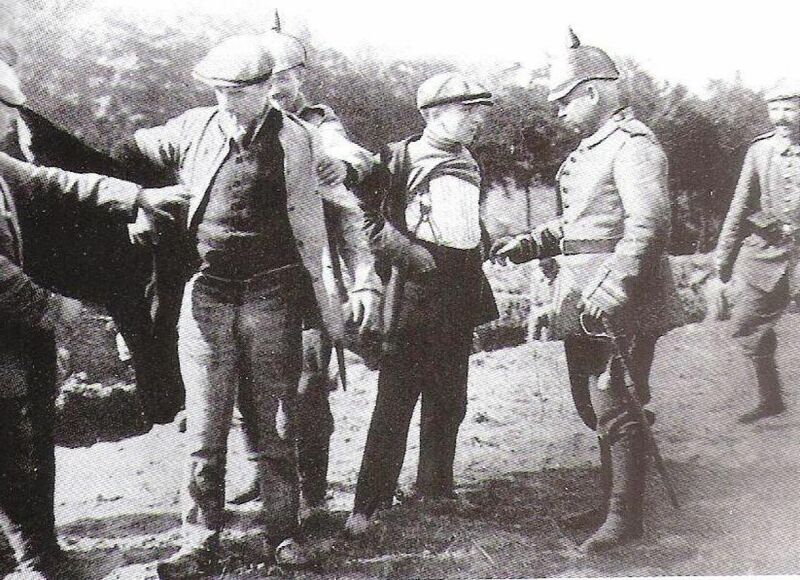 Indeed, the most commonplace practice was none other than to bribe the German guards posted along the border. Verification of Belgians (maybe traffickers? 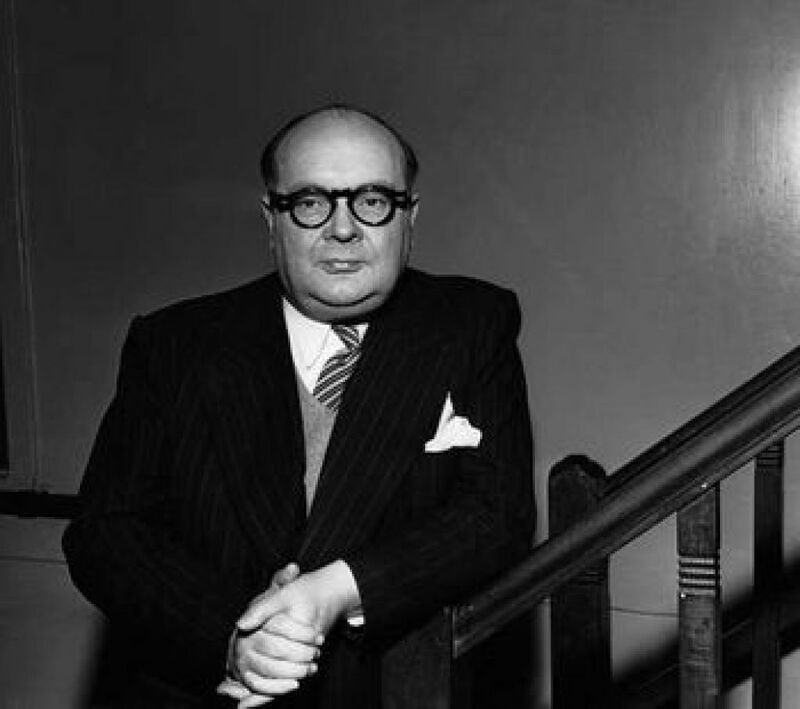 ), at the "Curtain"
But how can we forget to mention the best-known case of an attempted illegal crossing from Belgium to the Netherlands, namely that of the future well-known international statement Paul-Henri Spaak (1899-1972)? Barely 16 years of age, and against his father's advice, young Spaak decided to make contact with certain smugglers, in order to be able to join the Belgian army. Arrested not far from the crossing line, the young man is imprisoned in Turnhout. From there, he manages to write to his family and indicates, at the time, that the incarceration regime is more or less liberal, depending on the camps; as such, he writes to his grandmother, with an unshakable sense of humour: This year, I'm taking my vacations somewhat earlier than usual, and have withdrawn to a charming little town […], the surroundings of which I have unfortunately not yet managed to visit. I'm staying at the largest establishment in town. The place looks a bit sad […] In the office, I was given room 45 and then, as a kind of strange custom, all of my money was taken away […] Reading, when anything is available, is my favourite occupation […] I have already obtained five books. The authors are new to me […] Raoul de Navery is the author of some 50 volumes […] You might surely think […] that he's a rival for Ponson du Terrail or Xavier de Montépin. Not a bit of it, he's a Catholic and moral author whose main hero is God (with as large a G as possible). Though the books don't inspire great interest in me, I will at least derive […] wise counsel and its healthy literature that I want […] I'm in good hands and for my return, you can order a book of prayers. In fact, I go to church twice on Sundays and religiously listen to a sermon and exhortation… in Flemish. After Turnhout, Spaak will be transferred to the Sennelager camp (near Paderborne, in the North Rhineland), where he will remain for two years, until 1918. With the coming of the liberation on 11 November 1918, most the time, it was the inhabitants themselves who looked after destroying the electric fence. For farmers, this fence was sometimes useful for them as a convenient way of showing the dividing line between their lands and those of their neighbours. The remainders of the fence were often burned, both on the Belgian side and the Dutch side of the border. But everything did not happen quite as systematically as it might appear. 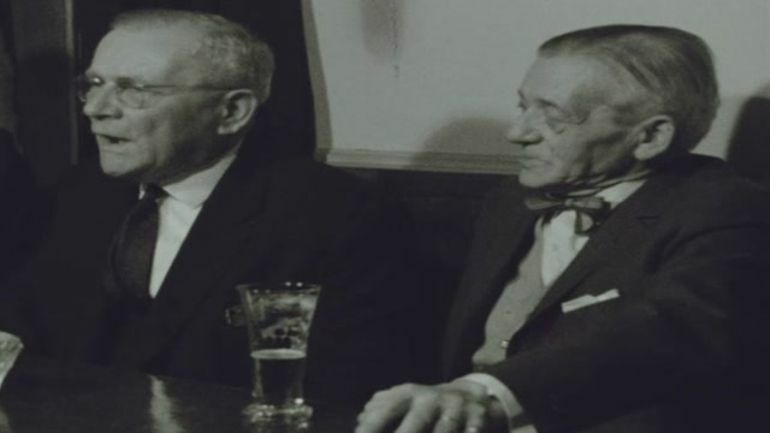 In conclusion, let us recall the case of Jan Van Looveren, a farmer from Meer, in the region of Hoogstraeten. In the final weeks of the war, rumours circulate that the fence's electric current has been deactivated by the German forces. On 12 November 1918, the country squire wished to join his family that had remained on the other side of the metallic barrier, in Wuustwezel. As bad luck would have it, the barrier was still electrified and he died on the spot. He was doubtlessly the last victim of the "Iron Curtain". Electrocuted cadaver found at the foot of the "Curtain"
Michel Dumoulin, Spaak, Brussels, Racine, 1999. Alex Vanneste "Le premier "Rideau de fer"? La clôture électrisée à la frontière belgo-hollandaise pendant la Première Guerre mondiale", in Bulletin trimestriel du Crédit communal de Belgique, 2000, n° 214, p. 39-82. Brand Whitlock, Belgium under the German occupation : memoirs of the American Minister in Brussels, Paris, Berger-Levrault, 1922.